Step two of my paperless initiative was to find a place to put all my papers. The idea of any filing system is to store your documents safely and securely for future retrieval when needed. In the physical world this is accomplished through the sorting of papers into appropriate file cabinets and folders. The papers are secure, and as long as they are not mis-filed, they are fairly easy to find when needed. Many people organize the documents on their home computer by creating an electronic version of a file cabinet and folder system. There is nothing wrong with this. It does have benefits such as keeping your papers safe, secure and available locally in your home. It also has some drawbacks. If, for example, your house burns down, you will lose everything unless you have an offsite backup plan. Also, while you could set up a number of different ways to access your information remotely, it is not easy for the average person to access the documents on their home computer while they are away. What if instead of loading the papers into your home computer, you instead loaded them into an electronic file cabinet stored on the internet, that is, in “the cloud.” And what if you had your own army of personal assistants that took every picture and PDF file that you gave them and they immediately copied every word, in every document, into a searchable database so that you could search for and find your documents just by entering any word that was in the document? And what if you could access that data on your Mac or PC, iPhone, iPad, Android phone/tablet, Windows Phone, Blackberry, or any other device via a standard web browser? Evernote is essentially an electronic filing cabinet service with cloud storage that allows you to access (and share with others if you choose) your data quickly and easily, from anywhere that you have internet access. The service is free for basic accounts and offers premium features for a monthly or annual fee. You can also organize notes into notebooks or even nested notebooks and you can share notes or notebooks publicly or privately. Evernote even assigns you an email address that allows you to forward emails, notes, snapshots, audio clips, and other attachments directly into your Evernote account without needing to use an app or web browser. Evernote also offers additional software such as Penultimate for note taking, and Skitch to take screenshots, annotate them and then automatically upload them for storage on Evernote. A very handy web clipper is available as well that allows you to automatically capture and upload web pages and/or links that you might want to refer to later. There is a huge Evernote fan base as well with lots of books, videos, and websites dedicated to helping you learn and get the most out of Evernote. If you are a Screencasts Online subscriber, Don McAllister has created several excellent screencasts about Evernote and continues to feature updates on Evernote as they come out with new features. I also found a vast number of Kindle books about Evernote available on amazon.com. I downloaded Mastering Evernote, the 2 Hour Guide by Brandon Collins, and it has been very helpful in getting me started. 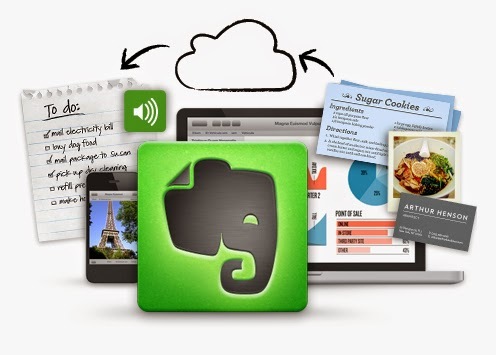 Evernote offers three levels of service: Evernote Free, Evernote Premium, and Evernote Business. Differences between the account types include a number of enhancements but much off it centers around upload limits, attachment size limits, and sharing limits. Evernote provides users with a meter that shows how much of your upload limit you have used and the meter automatically resets to zero each month. Search text, handwritten notes plus search inside PDF’s and images by keyword. After researching the various options (Google Keep, Microsoft OneNote) I jumped in with both feet and signed up for the Evernote Premium service. At a cost of $5.00 per month, or $45.00 per year, I feel it is affordable and should solve the problem of what to do with all of my papers. The killer feature for me is the ability to search your PDF documents. Most of my documents will be PDF’s that I have scanned and uploaded. With the Premium service, Evernote will automatically scan those PDF files with Optical Character Recognition (OCR) software and make the words in the PDF searchable so that I can easily find them later without needing to do a lot of tagging, etc. Depending on your needs, you can always try out Evernote Free service and then upgrade later if you find you are repeatedly hitting the free service limits. Next, I needed to figure out a convenient way to convert all that paper into the electronic versions of themselves so that I could upload them to Evernote. In the next post about my paperless initiative, I’ll talk about my search for a scanner to make this task a little less daunting. Evernote is available at www.evernote.com for free!